The other side of the Taj across the river Yamuna where Mughal History has been written in edicts of stone, the river Yamuna lined with the residences of mobility was the artery, the very lifeline, which fostered the development of Mughal Agra. This walk is designed for Taj Mahal and Beyond Taj. The Taj Mahal is one of the most famous buildings in the world, the mausoleum of Shah Jahan’s favorite wife, Mumtaz Mahal. It is one of the New Seven Wonders of the world, and one of three World Heritage Sites in Agra. Agra is one of the prominent destinations of the World Tourism map with three heritage monuments – The Taj Mahal, Fatehpur Sikri & Agra Fort. On our walk you will learn about the history of the city, culture, and heritage. With perfect architecture and idyllic trails, this city is an explorers and photographers paradise. Stop first at Akbar’s Tomb in Sikandra, the last resting place of the Mughal Emperor Akbar the Great. Follow your guide inside the red-sandstone tomb and admire the ornamental arch and pillars, its intricate and exquisite carvings and the marble interior boasting geometric and floral designs. 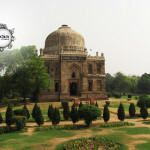 Followed by the Baby Taj and the Taj Mahal itself, and finally a stroll through the areas which include Sadar Bazaar, Kinari Bazaar and Munro Road. The Sadar, Kinari and Munro bazaars are open markets that shelter numerous shops which are absolutely stacked with goods. The Sadar Bazaar is known for its exclusive range of ethnic clothing, footwear and accessories.